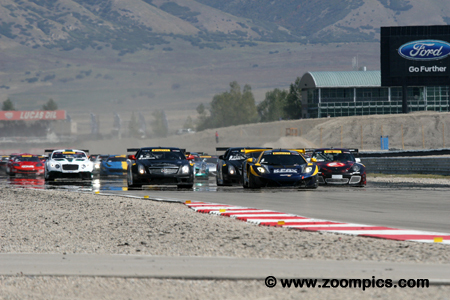 The season ended at Miller Motorsports Park in Utah. Rounds fifteen and sixteen for the GT cars would be held on the fifteen-turn 3.048-mile ‘Outer Course’. The start of the 2014 season finale. Robert Thorne in the K-PAX Racing McLaren 12C GT3 jumps into the lead and is followed by the Cadillac’s of Johnny O’Connell and Andy Pilgrim. 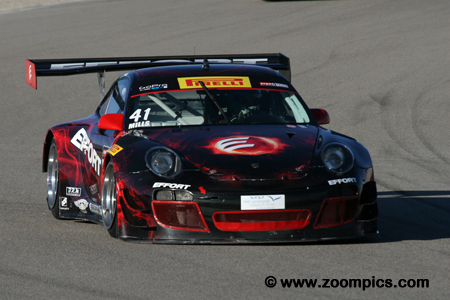 Ryan Dalziel driving the Effort Racing Porsche GT3R, at the extreme left, will drop into second before the first lap is completed. Guy Smith started from the pole in Saturday’s race but was not very quick getting off the line and dropped to sixth place. However, he fared better than some competitors – the standing start claimed four victims. 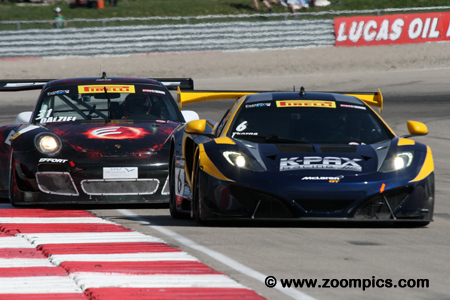 Smith moved up the order and was second when race leader Robert Thorne made contact with a GTS car. This incident gave Smith the lead and win. In the weekend’s second event, he started first and finished fifth. 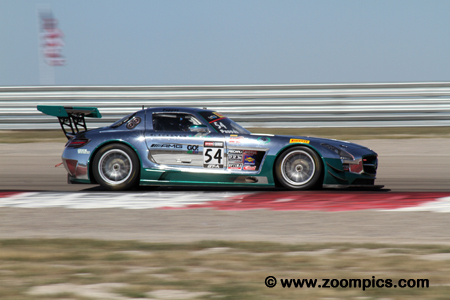 The Mercedes-Benz SLS AMG GT3 of GTA driver Tim Pappas was the second fastest GTA qualifier in round fourteen. 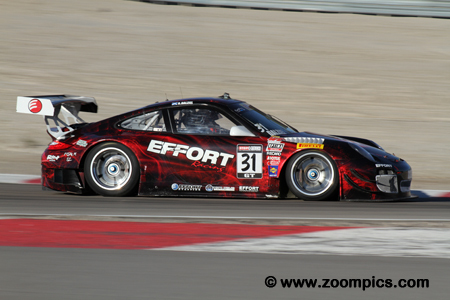 Pappas led the first eight laps until he was forced to pit with a mechanical issue this dropped him to last in class. In Sunday’s race, Pappas had better luck and scored his second GTA victory of the season. 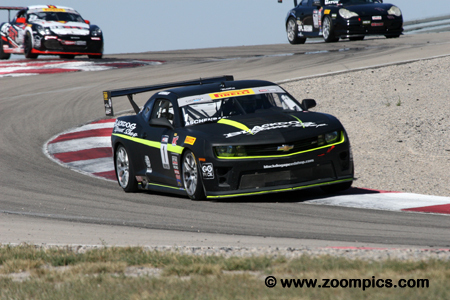 Entering the Miller Motorsports rounds, Lawson Aschenbach trailed GTS class leader Mark Wilkins by just two-points. In the first race, Aschenbach’s chance of securing another World Challenge title was greatly enhanced when he finished fourth and Wilkins was a DNF. 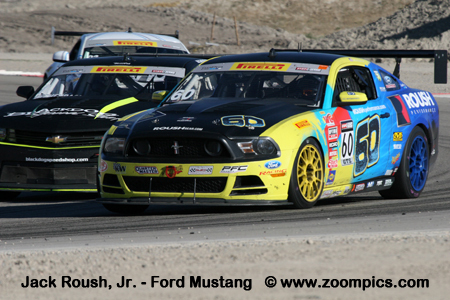 In the final race of the season, Aschenbach was second in class at the checkered flag. This earned him a second consecutive GTS championship. It was a disaster for GTS points leader Mark Wilkins in the Kia Optima. Wilkins started on the GTS pole for Saturday’s race but broke a half-shaft on the starting line and was hit by his teammate Nic Jonsson. In the season’s finale, Jonsson led the first seven laps before encountering a half-shaft issue and Wilkins retired with overheating problems. 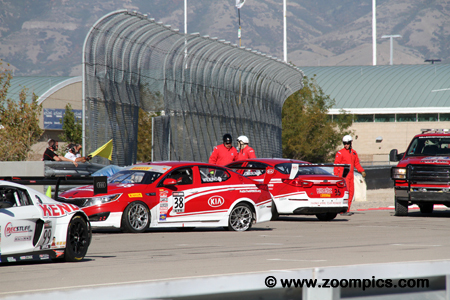 Despite these setbacks, Kia captured the GTS Manufacturer’s Championship. 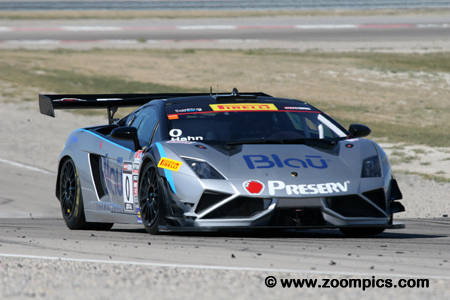 Marcelo Hahn driving a Lamborghini Gallardo FL2 prepared by Reiter Engineering was the fourth fastest GTA qualifier in Round fifteen and finished second in class. In Sunday’s event, Hahn repeated his performance with another second in the GTA category. 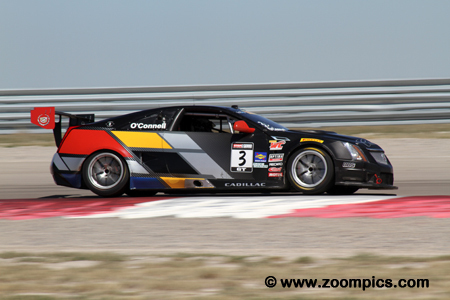 GTA driver, Michael Mills finished ninth overall and first in class during Saturday’s contest. As the category’s points leader, he moved one step closer to securing the title. In the final round of the 2014 season, Mills was third at the checkered flag which allowed him to claim the Sportsman’s Cup for GTA drivers. 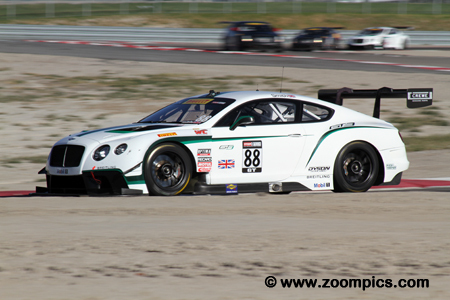 In round fifteen, Johnny O’Connell qualified eighth but made a great start which allowed him to battle with Butch Leitzinger in a Bentley for second. O’Connell prevailed and was the runner-up at the checkered flag. Sunday’s results were less impressive but the outcome was more important. O’Connell started from the sixth and finished seventh which was enough to give him his third straight GT Driver’s Championship. 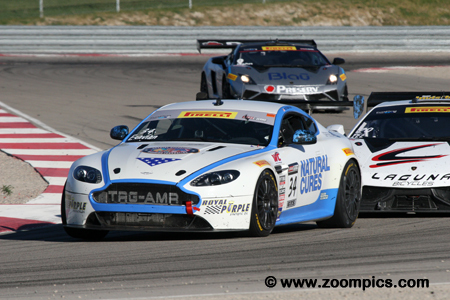 Driving an Aston Martin GT4, Nick Esayian started the event by having his best weekend of the season. Esayian started fourth in GTS but found himself second after the incident with the Kias. Contact on lap-19 for Jack Baldwin, the class leader allowed Esayian to move out front and win by 3.592-seconds. This was his second World Challenge victory, the first being at VIR in 2010. The following day Esayian finished sixth in GTS. Robert Thorne started from the fourth grid position in round fifteen but after some starting line incidents, he found himself in the lead. Thorne would maintain first place until lap-14 when he made contact with a backmarker and spun. He fell to a sixth place finish. Thorne redeemed himself in the weekend’s second race when he led flag to flag to score the first win for the K-PAX Racing McLaren. Qualifying second in GTS was Jack Baldwin but he grabbed the class lead after the race one restart. Baldwin maintained first until lap-19 when he made contact with Andy Lee driving a Lamborghini Gallardo. Baldwin recovered and finished second in class. In the final race of the season, he took the lead on lap-9 and went on to score his third GTS victory of the year. 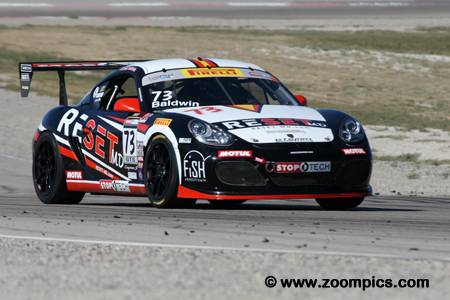 Ryan Dalziel started the Effort Racing Porsche GT3R in the fifth grid position for Saturday’s race. Dalziel retired after just nine laps and finished thirteenth in the GT class. In round fifteen of the 2014 season, he started third but followed race leader Robert Thorne into the first turn. Dalziel pressured Thorne throughout the contest but could not pass – he finished just 0.130-seconds behind the winner. 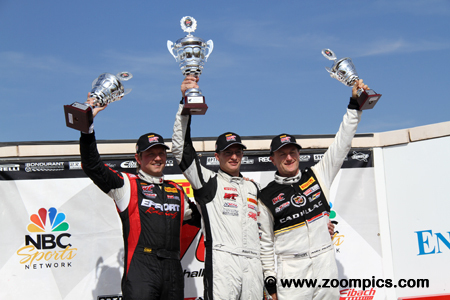 The World Challenge GT class podium at the 2014 season finale. On the left is second place finisher Ryan Dalziel and the right Andy Pilgrim, who captured third. Between these two is the winner Robert Thorne. After a season of learning the intricacies of the Mclaren, Thorne and the team were able to score K-PAX Racing’s first win with the new car.